Pollinator Gardens are a beautiful way to take part in supporting the health of nature. Even the smallest creatures play an essential role in our environment, and many important pollinators are threatened. We can support them by planting their food - flowers! Also, we can create and maintain habitat areas to cultivate biodiversity. On any scale - from a patch in the front yard, to beside highways, or in-between different crops on the farm, this is a powerful way to increase the health of the environment, and to have flowers. Win-win. One of our goals in creating gardens and doing landscape design is to have flowers blooming all season long. Even in small gardens, this can be a reasonable goal to achieve. It takes planning and time to transition degraded or less-productively used areas back into healthy ecosystems. There are a few ways to go about it, depending on the variables in the landscape, the scale, and the desired outcome. 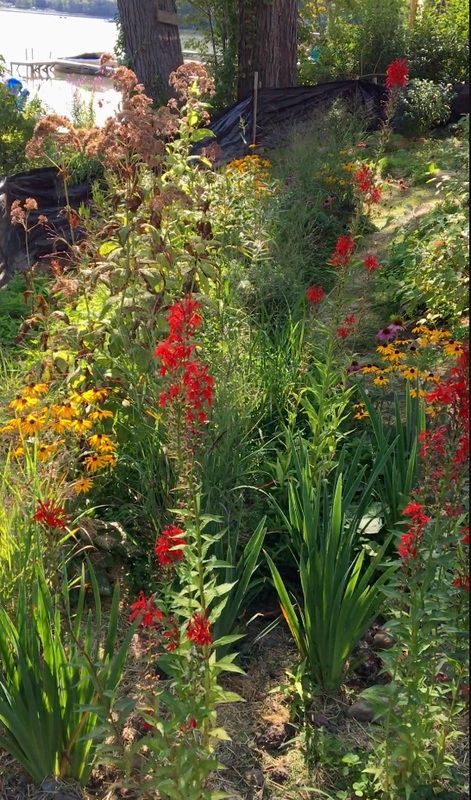 Rain gardens made to catch and sink water, land at the edge of the forest, sides of buildings, or under trees where the grass grows poorly are examples of landscaping opportunities for planting pollinator-supporting plants.